Waitrose Fresh British Chicken Breast Fillets are a tasty, versatile ingredient to cook with and a healthy, low fat option. They contain only 0.6 per cent fat and if poached or baked rather than fried, make a perfect meal for anyone watching their fat intake. 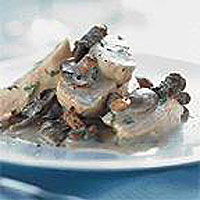 Served in a wild mushroom and champagne sauce, this delicious main course dish shows that low fat can be indulgent too. Place the chicken breasts in a single layer in a large saucepan. Pour over the champagne or sparkling wine and bring to the boil. Reduce the heat, cover and simmer gently for 15-20 minutes, until the chicken breasts are thoroughly cooked. Heat the oil in a frying pan and cook the mushrooms for 2-3 minutes, turning occasionally, until golden. Strain the chicken breasts, reserving the liquor, and keep warm. Add the reserved liquor to the mushrooms and allow to bubble for 3-4 minutes. Reduce the heat and stir in the crème fraîche and tarragon. Simmer gently for 2 minutes, until the sauce has thickened slightly. Season to taste. Slice the chicken breasts diagonally into thick slices and arrange on four warmed serving plates. Pour over the sauce and serve straight away with white and wild rice together with steamed green beans tossed in a little lemon juice for a delicious fresh flavour. Champagne and chicken are a wonderful flavour combination, but if you don't want to splash out on the real thing a sparkling dry white wine works just as well instead.